Marrying your best friend is pure bliss. Making a decision that will affect every part of the rest of your life is obviously important; choosing to marry the person you are closest to elevates your friendship to a status that couldn't be imagined before you joined your lives together. This portrait after their church ceremony was captured with a wide angle, fast lens, which throws the background out of focus while keeping it accessible and visible, lending a sense of place without distracting the viewer from this blissfully happy bride. 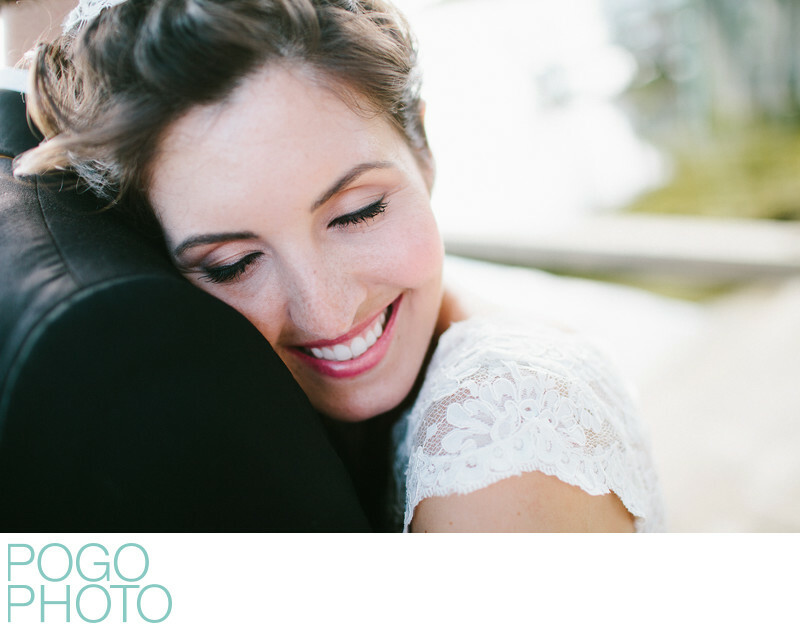 Finding a documentary wedding photographer who isn't afraid to get in close is vital to capturing the feel of the entire day, and in this case one can almost feel like they are part of the embrace, can almost feel the soft wool tuxedo jacket pressed against her cheek. Choosing your vendors carefully can make an enormous difference to the end results of your images. One of the things we recommend splurging on is excellent makeup artistry. This bride chose the immensely talented Vivian L. Infantino as her artist, and the resulting photographs are natural and beautiful, with skin that still looks like skin without being retouched, and enhancement of all of her features without looking overly made up. The best wedding makeup artists in Vermont and Florida work to make sure you're going to shine as a perfected version of yourself, and Vivian is tops in her field for natural wedding makeup. Location: Winter Park Racquet Club, 2111 Vía Tuscany, Winter Park, Florida 32789.